This section discusses several additional features of LinkMachine that not everyone will have occasion to use, but are worth noting. LinkMachine offers the option of automating the link management process. It can automatically check all of your reciprocal links on a regular basis; e-mail reminders to webmasters who have been sent link exchange invitation e-mails; e-mail notices to the webmasters of sites that are missing their reciprocal link back to your site, or whose reciprocal link back to your site no longer meets the location and PageRank requirements you chose under Link Approval Settings, and remove a site from your link page if its reciprocal link has been missing or has failed to meet your quality requirements for an extended period of time. All of these options are available via Change Settings >> Automation Settings. In order to enable the automation features on your site, LinkMachine's automation script must be called on a regular basis - preferably at least once per hour. This can be done by running a cron job on your web server, or by inserting code into one of your site's more heavily trafficked pages (such as the home page) that will call the automation script whenever a visitor views the page. Both of these options are explained under Enabling Automation at the top of the Automation Settings page. LinkMachine keeps a record of every action performed via automation. You can view this Automation History at the bottom of the Automation Settings page. When checking a site for its reciprocal link, LinkMachine Premium can spider the site's pages in search of the link if its isn't found at the site's Reciprocal Link URL (or if no such URL is provided). This causes the reciprocal link check to take longer, but allows LinkMachine to find links that have been moved. The Maximum Number of Pages to Spider for Link Check can be specified on the Automation Settings page. The higher this number the more likely LinkMachine will find a link that's been moved, but also the longer the reciprocal link check will take. By default, the filename of your main link page generated by LinkMachine will be "resources.html", and the file will be located in your site's "linkmachine/resources/" folder. However, you can change the filename of each page that LinkMachine generates, and you can change the location on your site where they are placed. This is especially useful if you'd like LinkMachine to replace existing link pages that have already gained PageRank and been indexed by search engines. Under Change Settings >> Site Settings, you can change the Filename of Main Link Page and the Filename of Link Submission Form. You can also change the Location of Link Pages to refer to any directory on your web server. Make sure that the directory you specify here has its write permissions turned on, so that LinkMachine will be able to generate the files within that directory. By default, the link page generated for each category of links is based on the Filename of Main Link Page. For example, if your Filename of Main Link Page is set to "resources.html", the filename of the link page for the category "Real Estate" would default to "resources_real_estate.html". You can however specify a custom page filename for each category, if you wish. To do so, go to Change Settings >> Link Categories, select a category from the list, enter the new filename under Category Link Page Filename, and press Update Filename. Under Change Settings >> Text Settings, you have the option to change any of the standard text that LinkMachine adds to the link pages and site submission form that it generates. This includes the standard link page navigational links, the titles and descriptions of the entry fields on the site submission form, and other standard text used on the link pages and site submission form. This can be especially useful if the target audience for your site speaks a language other than English; you can translate the standard text to the appropriate language. You can also modify the standard text however you would like to better fit the personality of your site. By default, a title, a few sentences instructing a visitor to place a reciprocal link on their own site, and a box containing sample html code for that link, are included at the top of the site submission page. You can change the text of the title or the reciprocal linking instructions, under Change Settings >> Text Settings. You can also remove the entire standard submission page header (if you'd prefer to include this information in your own page template) by un-checking the checkbox labeled Show Submission Page Header, under Change Settings >> Link Page Format >> Advanced Options. Note that if you use alternate profiles, the standard submission page header is especially handy because each time it is displayed, it will choose randomly from among your site's primary profile and all of its alternate profiles, to determine what information to show in the suggested reciprocal linking code. When a visitor submits a link and their submission is accepted, they are shown a standard "thank you" page. If you'd like to provide your own page for a visitor to be directed to after successfully submitting a site, you can specify the URL of this page under Change Settings >> Link Page Format >> Advanced Options >> Submission Result Page URL. A common problem when uploading a page template to LinkMachine is that the images and links on the template don't work. This is because a page template created with an editor such as Frontpage will usually use relative links (such as "images/logo.gif") rather than absolute links (such as "http://mysite.com/images/logo.gif") and so the links depend upon the page being located in a particular directory, in order to work correctly. The link pages that are generated based on the template end up in a directory that's often different from the one that the relative links in the template are relative to, so the links don't work. LinkMachine's Smart Template Linking feature addresses this problem by replacing the relative links in a page template with absolute links, before generating the link pages. To do this, it assumes that the template was created as if it were to be placed in your site's main directory. Smart Template Linking can be turned on or off under Change Settings >> Link Page Format >> Advanced Options, using the checkbox labeled Use Smart Template Linking. It is turned on by default on new LinkMachine installations. Under Change Settings >> Link Approval Settings you'll find several options for having LinkMachine automatically reject link submissions that do not meet certain criteria. Check the box labeled Require Reciprocal Link Before Accepting Submission to have LinkMachine require that a submitted link have a working reciprocal before it will be accepted. Check the box labeled Require That Each Reciprocal Link Is Unique to reject a link submission if its reciprocal link URL is the same as that of any other link already in your database. Using the drop down menu labeled Required Minimum PageRank For Site, you may choose to automatically reject link submissions for sites where the target page (the page you'll be linking to, usually the site's home page) has a PageRank below the value you choose. Using the drop down menu labeled Required Minimum PageRank For Reciprocal Link, you may choose to reject link submissions if their reciprocal link back to your site is located on a page whose PageRank is below the value you specify. You can also choose the Required Location For Reciprocal Link, to require that a reciprocal link be located on the same page that your site will be linking to, or at most one link away, or that it be somewhere on the same domain. You can also allow the reciprocal link page to be located anywhere. Finally, you can enter any number of words or phrases in the Content Filter text box. Each word or phrase should be on its own line. A submitted link will be rejected if the page at that URL contains any of the words or phrases that you list in the content filter. This is a handy way to keep unwanted types of sites out of your link directory. Normally LinkMachine will set the status of a newly submitted site to Not Yet Reviewed. You will then need to approve the site before it will be added to your link directory. This allows you to filter out any unwanted sites before they are added. If you would prefer the additional automation and do not wish to pre-approve all links before adding them to your directory, you can turn off the approval requirement under Change Settings >> Link Approval Settings, using the checkbox Require Admin Approval Before Posting Submitted Links. With this turned off, submitted sites will automatically have their status set to Link Exchange Complete. Normally, each link category that you create on the Link Categories settings page is open to visitor link submissions. If you would like to create a private link category that only you (as the admin) can add links to, select that category from the list on the Link Categories settings page and check the box labeled Exclude Selected Category from Submission Form. You may choose to have LinkMachine place a bullet point graphic before each category, subcategory, and/or link in your link directory. Under Change Settings >> Link Page Format >> Advanced Options you may choose for each of these, whether to show no bullet, the standard round bullet, or a custom bullet image. If you choose Custom, you may enter the URL for your custom bullet image. Bullets can be useful for visual organization and to further incorporate the look of your site into your link directory. Under Change Settings >> Link Approval Settings, you can set a maximum limit on the number of your InstantLink exchanges (link exchanges with other LinkMachine users) that can be automatic exchanges. An exchange can be automatic if it is with another site that shares at least one category with your own site. If you would prefer to make no automatic link exchanges (and instead require approval of each InstantLink exchange before it's completed), you may set this number to zero. After purchasing LinkMachine Premium, your account is licensed to be used on up to three different web sites. If you would like to use LinkMachine on more than three sites, you may purchase additional site licenses. Under Change Settings >> Upgrade LinkMachine, you will be shown the number of site licenses you own, and how many are currently in use. You are also given the option to purchase one additional site license for $10, a block of eight site licenses for $50, or 50 for $200. 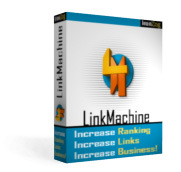 To install LinkMachine on a new site, simply install it as you did on your first site, using either the automatic online installer or the installation script. Then log into LinkMachine on the new site using the same account information that you use to log in to your original LinkMachine installation; do not create a new account for the new installation. This way, if you upgrade your LinkMachine account the upgrade will apply to all installations where you use that account. A site's Modify page is where a site's information can be changed. To go to a site's Modify page, click on the Modify link on the site's entry in the Site List. You can have LinkMachine attempt to automatically retrieve a site's title, description and e-mail address, by entering the site's URL and clicking the Fetch Info link. LinkMachine will only fill in fields that are blank, so as not to overwrite any information that you've already entered. Below the label Site URL is displayed the site's Alexa rank. If you've opted to have LinkMachine show a site's Google PageRank, then the PageRank of the site's main page will be displayed here as well, and the PageRank of the page containing the reciprocal link to your site will be shown under the label Reciprocal Link URL. You can use the Check Link option beside the label Reciprocal link URL to check this individual site's reciprocal link. On the Modify page you many enter an Administrator Memo. This is a note to yourself, and will not be displayed on your link pages or anywhere else besides this admin page. You may choose to display a special icon or image beside a link. On the Modify page, under Link Icon Image, you can choose whether to display no image, a custom image, or a previously used image beside the site's link. If you choose Custom, enter the URL of the custom image. This can be useful for showing rating graphics, attention getter icons such as "New" or "Hot", or custom images containing, for instance, the logo of the particular site. By default every link has a weight of 0, but you can make a link appear toward the top of its list by increasing its weight, or toward the bottom of the list by decreasing its weight. You may also enter Alternate Link Text for a site. The text you enter here will display in the browser's status bar when a visitor moves the mouse over the site's link in your link directory. This can be useful for hiding affiliate links. Next is the URL of the page where the site's webmaster can go to edit the link's information and the URL of the page in your link directory where that site's link can be found. Finally, at the bottom of the Modify page are several useful information links about the site. These include the site's Alexa information page, its Internet Archive history page, and its list of backlinks according to either Google or the MSN search engine. For most sites, customizing the look of the link directory pages using page templates as described earlier will be sufficient. For webmasters who would like to customize their pages even further, there are advanced customization features. Normally a page template will include the keyword #CONTENT#, which LinkMachine will replace with the full contents of that link directory page. But if you would prefer to arrange the various elements differently than the standard arrangement, you can leave out #CONTENT# altogether and instead use any combination of the following keywords in your template, each of which will be replaced with its corresponding element: #CTG_LIST#, #FEATURED_LIST#, #SEARCH_BOX#, #LINKS#, #STYLES#, #ALIGNMENT_OPEN#, #ALIGNMENT_CLOSE#, #PAGE_NUMBERS#, #NAV_LINKS#, #AUTOMATION_TAG#, #INSIGNIA#, #CTG_NAME#, #CTG_DESC#. In addition, you can modify the very Php code that is used to generate some of the elements that make up your link directory pages. This is done on the Link Page Format settings page, under Advanced Options, by modifying the Element Templates. For example, you could change the Link Template so that each link displays the site's URL below its description. Sometimes it is handy to be able to transfer your links or link categories from one LinkMachine installation to another, for example if you want the same links or categories to appear on multiple sites. To do this, go to Change Settings >> Backup Data. From this page you can export LinkMachine's link and category data as a .csv file. This is a text file that can be opened and modified in a text editor such as Notepad or a spreadsheet program like Excel. You can add, change or remove links or categories this way if you'd like. You can then import category data from a .csv file into LinkMachine from the Backup Data page, or import links from a .csv file by going to Add Sites To The List and selecting Add the links from a .csv file.